Our selection of Leather Furniture spans each main category, including leather living room products, reclining furniture and sleeper sofas--all in 100% top-grain leather. Top grain leather is the most durable upholstery option for home furnishings. 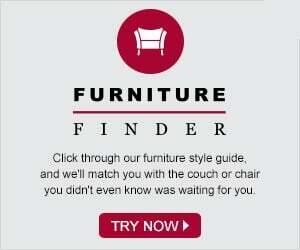 All of our leather furniture is customizable in a wide array of colors, grain types, and more. Browse the selection below, and customize the piece to your liking in our Design Center. What is there to say about Leather Furniture? First off, Savvy Home uses top grain hides for all available leather furniture. That is, during the tanning process, each piece of leather is divided into sections. The top section, top grain, is the best quality and most valuable part of the hide. Top grain leather has extraordinary durability and strength. Leather is an all-natural textile and no two pieces are identical. That said, it takes extreme skill and a good eye to upholster furniture in leather in order to match grains and color to create a beautiful piece. Leather upholstery is the easiest to clean natural option on the market. Some use a damp cloth, some use leather cleaner and some use lemon wood polisher. Whatever floats your boat, it’s a very forgiving upholstery option. In addition to ease of cleaning, there is an overwhelming satisfaction of owning a leather piece of furniture; the smell, the warmth, comfort and, of course, it is aesthetically pleasing from the day it is delivered to the day you pass it down to your child. Leather furniture has the tendency to mold around your body and stretch with age – this is what makes leather furniture a piece you’ll have for the long run. Our leather upholstery selection offers the full array of our furniture categories: chairs, sofas, recliners, and the very difficult to find leather sleeper sofa. With over 650 options, over 550 of which are fully customizable, you’re sure to find precisely what you’re looking for to perfectly fit your space. The range of styles varies from traditional pieces all the way to our modern leather furniture, with more options and accessories than you could even imagine. The 15 available brands allow our customers to hone in on a specific look, or remain loyal (or match their previously purchased pieces) to a specific brand. Our design center feature also offers leather options – filter between hide types, durability, and softness of texture. Come take a look!